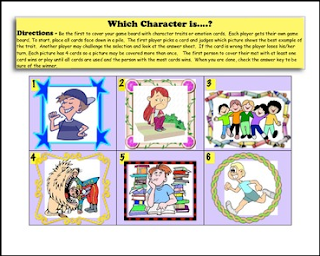 Your students will be engaged with these easy-to-prepare games as they learn 24 new character traits and synonyms. There are 6 sets of 4 synonyms ranging from easy to challenging. Students play a game using illustrations as clues to judge the character trait that belongs with the correct picture. This is a great game for your ESL student. They then move on to a synonym matching game where they can compare the 24 character trait synonyms they just learned. A practice sheet assesses student understanding by asking them to read a trait, think of a synonym and then use it in a sentence.